Perfectly Created Chaos! : Who needs sentiment? I hope you had a great holiday weekend. Ours was good, although it didn't turn out quite the way we expected, it was still good. I didn't get a chance to do any stamping yesterday, so I'm a bit behind in my weekly challenges. This is my Mojo Monday card. I combined it with the SCS color challenge to use Bermuda Bay, Apricot and Chocolate Chip. It's hard to see, but the Apricot piece in the back is stamped with Fine Lace Background stamp in Apricot Appeal ink. 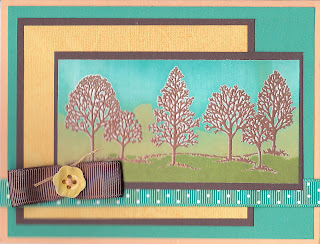 I embossed the trees from SU's Lovely as a Tree set with versa mark and embossing powder on glossy white card stock. Then, I used my brayer with Old Olive, Apricot and Bermuda Bay to make the background. I have no idea how I did it. Usually, when I use my brayer, it's a gamble; and usually one that doesn't come out very well. This time, however it did come out rather nicely. I added the Bermuda Bay ribbon across the bottom with the chocolate chip and the button in the center to finish the card. I realize that there is no sentiment; but I just couldn't find a place to put one, so as I said, "who needs sentiment?" Beautifully done! How I love what you did with those gorgeous trees!! The colors are just fabby!! The background behind your trees is beautiful. I like how you combined the two challenges. They go well together. I agree... sometimes a sentiment is unnecessary if it would compete with the design.